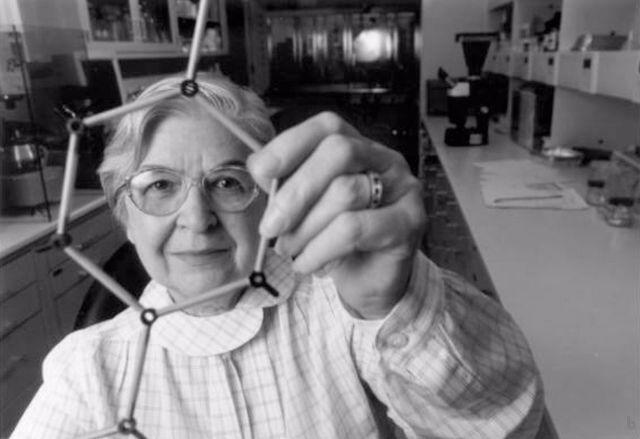 Stephanie Kwolek is the chemist who invented Kevlar in 1965. She started working as a chemist in 1946 just to earn enough money to go to medical school, to fulfill her childhood dream of becoming a doctor. She soon fell in love with the work, though, which combined her interests in science and textiles. One of very few female chemists working at Dupont, she was passionate about discovering new ways of working with synthetic fibers. She volunteered in 1964 for a project none of her colleagues seemed interested in: searching for a strong but lightweight fiber to use in tires. While experimenting, Stephanie created a strange solution that was very different from ones she’d created before. It should have been a clear, thick fluid, like nylon polymer, but instead was thin and cloudy. “I think someone who wasn’t thinking very much or just wasn’t aware or took less interest in it, would have thrown it out.” But her curiousity and passion for discovery won out. The next step in the process of creating fibers from this solution required a machine called a spinneret, which was run by her coworker Charles Smullen. At first, he refused to spin the solution, thinking it would harm the machine. After much persuasion, Stephanie convinced him to run her solution. They were amazed when the new fiber came back: it would not break when nylon typically would, and had a stiffness at least nine times greater than anything she’d made before! She and her supervisors immediately recognized the significance of her discovery, and the company set to work creating applications for this incredible new fiber.